Surprise…it’s still raining! What a gloomy April Sunday don’t you think? 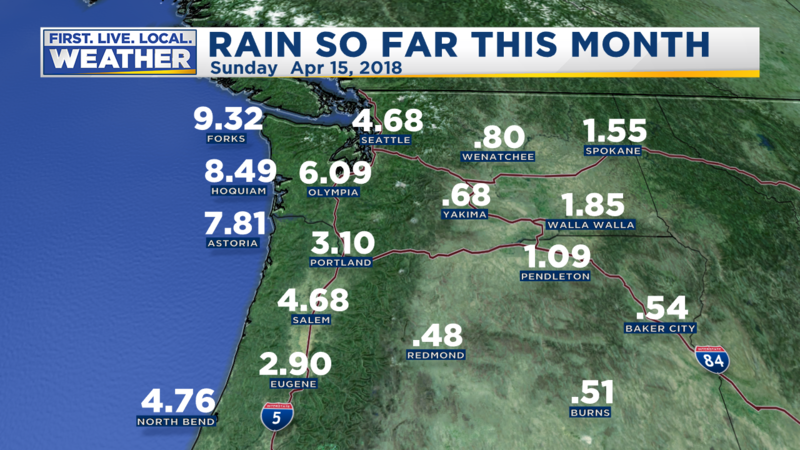 We’ve picked up about a third of an inch of rain here in Portland, but more than 1/2″ fell once again in Salem. Yesterday over 2″ fell in parts of western Washington. 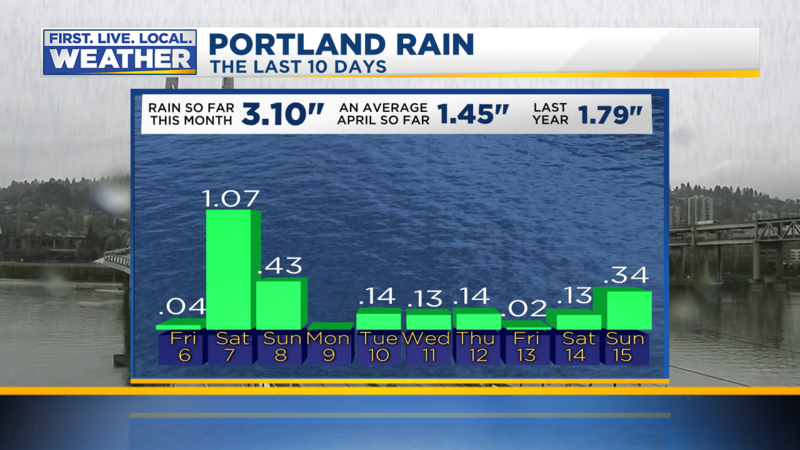 Yes, April has been much wetter than average. We’re halfway through the month; check out those monthly totals so far! But the weather pattern will become far more “reasonable” this week. 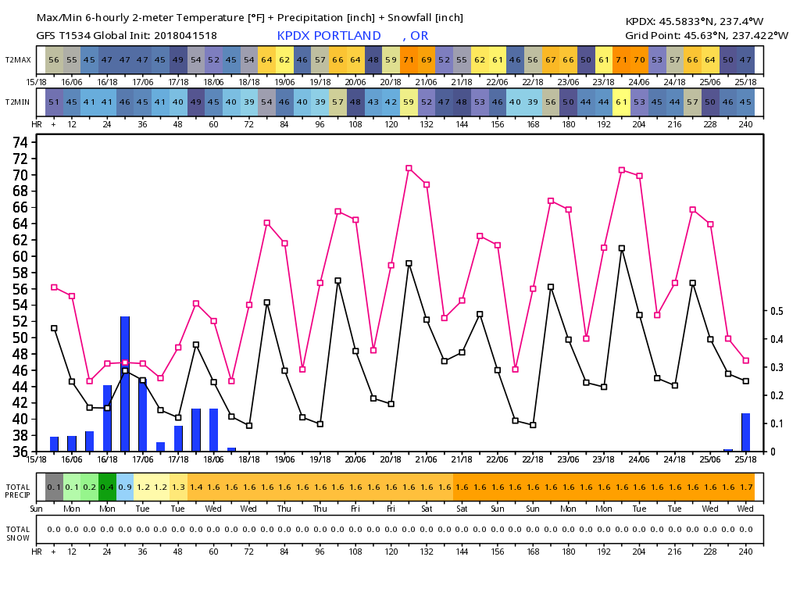 By that I mean we’ll be drying out quite a bit…after Tuesday. By 2am note the lowering pressures over Washington, both western and eastern sides of the state. Quite a southerly gradient through the Willamette Valley! Then by 8am the weaker low has been absorbed by the 989mb center in southern British Columbia. This is a windy pattern for the Pacific Northwest so you can expect a windy day Monday after tonight’s gusty wind. We’ve already seen gusts in the 30-40 mph range in parts of the Willamette Valley and south metro this past hour. I see a 35 mph gust suddenly just arrived at I-205/Division ODOT sensor and a 39 mph gust at Aurora. We have 12-18 hours of wet & windy weather on tap. Upper-level heights rise as the weakening spring jet stream pushes farther north more often. To wrap it up…AFTER Tuesday I see a much milder/nice mid-spring weather pattern ahead. Not totally dry, but our gardens/lawns/fields will get a chance to dry out. This entry was posted on Sunday, April 15th, 2018 at 9:01 pm and is filed under Weather. You can follow any responses to this entry through the RSS 2.0 feed. Both comments and pings are currently closed. We did get those late February snowstorms though. Got suddenly windy in Beaverton. 6.06″ at my location in Milwaukie as of last night. Another 0.05″ by the time I left for work. Clouds look to be thinning out and breaking up this morning, but with how cold it is above, methinks that’ll translate to some pretty heavy showers this afternoon. Already seeing what looks like post-FROPA popcorn on radar. Maybe it’s going to be a “photo-finish” between us; I had 5.64 inches last night at 9pm, but with showers overnight (about 0.20) we’re closing in on 6 inches. Last year’s April was at 6.17 inches- so that’s bound to be passed, anyway. I wonder what downtown is at? PDX is at 3.24”. Huge discrepancy between the airport and other areas. 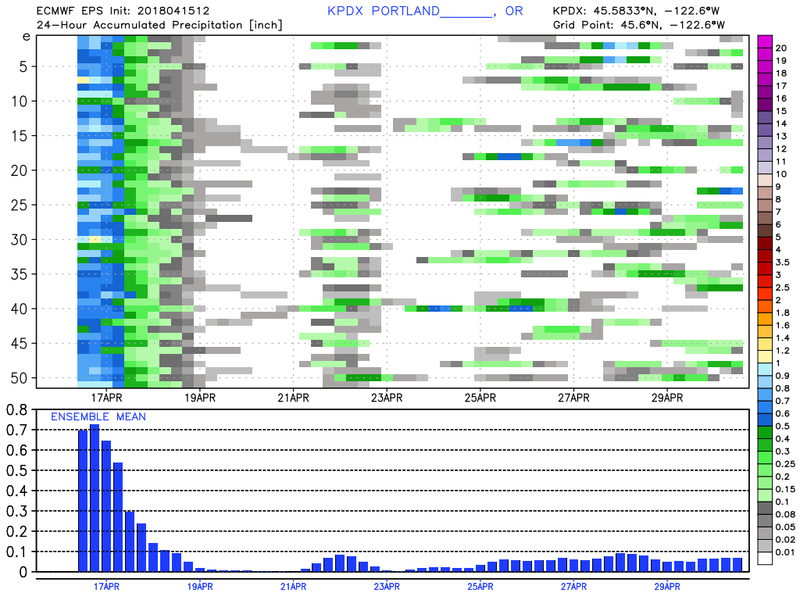 Based on the long-term forecast, officially, Portland will likely have just a bit more rain than average in April. Wind has slackened here. Will it pick up and gust 30-40 mph again? It has indeed been a windy and rainy Sunday evening, and still is at midnight! It’s great, I can hear the wind, and I can feel it because the windows rattle just enough to let me know it’s there! The Cat seems to love it too, sitting on the 2nd story balcony railing, in the dark, in the rain, and the wind, which makes me feel a stab of panic for her safety. It also seems like strange behavior! But then again, she’s probably just geeking out on the weather—while she is a Cat, she did grow up in a Weather Geek household. Well, technically, complete Geek. Weather is the hobby part, Geek is sort of like, being French. Plus I keep thinking she’s going to “blow off” the rail during one of the 20 MPH gusts! Winds are roaring here in the West Hills. Fun! Not that I’m complaining, I kinda like hearing it out my window. I didn’t get to work until 2:30pm, but I had the forecast done by 3:30pm. South 20 g35 mph was in all my graphics at 5pm. You had…well…4-5 hours notice. I was out playing in the woods. Glad the winds didn’t come in sooner, or that could have been dangerous, especially with how many trees apparently came down over the Winter out there. Was also surprised to see about 8 inches of new snow down at 2,200 feet. I know for a fact the forecast was for 4,500 feet and above! I have proof!! Snow levels will lower to around 4500 feet late tonight and Sunday morning while a moist front begins to move over the Cascades. Thanks for the update Mark. You answered my question earlier about the strong winds were having in Albany.